City of Milwaukee: 809 Garden Roof | Hutchinson Design Group, Ltd. The building at 809 N. Broadway was originally constructed as a parking garage, including parking on the roof level. In the early 1980’s the building was converted to an office building and a bituminous roof installed. This original bituminous roof failed and was overlaid with a ballasted EPDM roof. 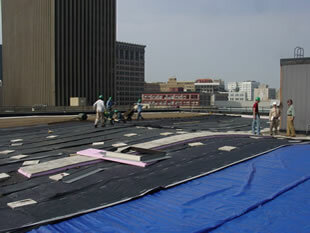 Roof leaks appeared in late 2005, giving impetus to reroofing considerations. The Department of Public Works (DPW) for the City of Milwaukee is on the cutting edge of building energy performance and environment synthesis within its projects; requiring 30 year minimum service lives for all building components, including roof systems. When replacement of the roof system at 809 became necessary, the DPW chose to set an example of environmental stewardship and responsibility by looking for a thermally efficient roof system that could sustain a garden roof cover; meeting their goals of sustainability. BStructural analysis of the existing concrete structural system revealed its ability to support a garden roof system. It was also determined that the structural concrete could be saw cut and removed so as to install a skylight and provide natural daylight to the interior office space; potentially improving work conditions and worker productivity. Field investigation revealed that the existing roof system was composed of gravel ballast, 45 mil EPDM, EPS insulation, and steel copings over the original bituminous built-up roof. The gravel ballast was specified to be vacuumed off and was reused. The EPDM was cut, rolled and sent to a re-synthesizer for recycling; the EPS insulation and steel copings were removed and also sent for recycling. 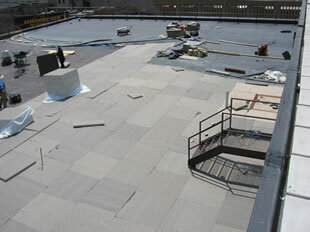 The built-up roofing was removed to expose the concrete roof deck for inspection. Syntec EPDM Penthouse: Ballasted 90 mil. Installation of a 2-ply vapor retarder to the concrete roof deck.T Renovation of all roof drains with new extension rings, domes, clamping rings, and bolts.T New wood blocking atop the parapet to provide an inward slope to the coping.T Raising of all exhaust fan curbs, plumbing vents, and roof top units to accommodate the new height of the thermal insulation.T Installation of 2 layers of 25 psi, 2 ½” thick polyisocyanurate insulation and saddles in a full mopping of hot asphalt, joints staggered, R 30. ½” polymer modified gypsum cover board, set in hot asphalt. 90 mil EPDM, fully adhered, all seams cover stripped. A water test was performed to confirm performance of roof system prior to the installation of the garden roof cover. Thermocouples were embedded into the roof system in 3 locations: (1) Below the thermal insulation, (2) below the EPDM, and (3) within the growth media to monitor the thermal heat gain.BThe garden roof coverings consisted of the following:BT Root barrier, drainage board and moisture retention mat. 4” growth media and erosion barrier mat. Plantings: 25,000 sedums of several varieties selected for the geographical location were planted. The plantings were watered through the fall and appear to have a 97% growth rate. 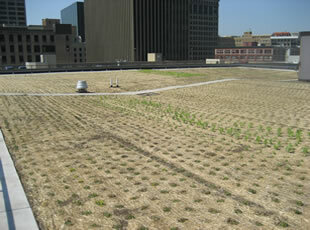 The roof plantings will be inspected in mid-spring, and all plants not exhibiting growth will be removed and replaced. In August 2007, the Mayor of Milwaukee along with his deputies, representatives of the Department of Public Works, contractors, and Hutchinson Design Group held a press conference to highlight this example of environmental stewardship.